An emoji of a face in tears posted by a senior bureaucrat in Chhattisgarh elated many at the onset of New Year. The message in one of the WhatsApp groups of the state’s Indian Administrative Service (IAS) officials was in response to a development that came as a big shock to them. A day after removing chief secretary Ajay Singh, the Congress government led by Bhupesh Baghel issued an order to allot the sprawling bungalow earmarked for the administrative head of the state to a junior minister. The bureaucrats within the state accepted the decision with a heavy heart, but those outside the state on deputation dared to react. The message implied in the decision was a big one — that bureaucrats would not enjoy the clout they did in the previous Bharatiya Janata Party (BJP) government. 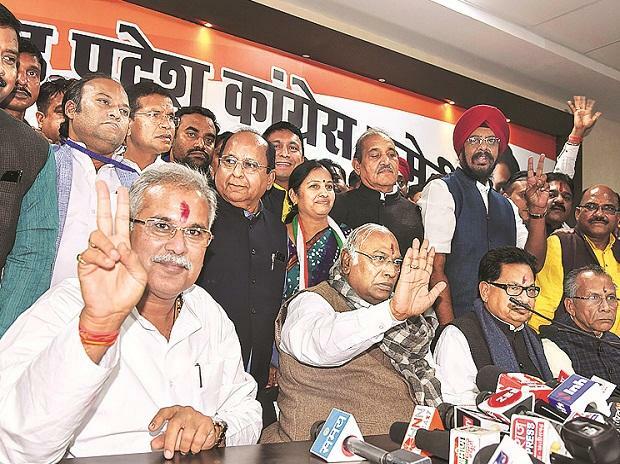 Raman Singh, who led the BJP government for 15 years, had been accused of, even within party forums, for working under the influence of a group of officials that cost the party dear in the elections. Unlike Singh, who preferred to continue with the chief secretary and the director general of police appointed by the previous Congress government led by Ajit Jogi in 2003, Baghel went for an overhaul. The very next day of assuming office, he removed the top brass of police and appointed D M Awasthy to the position. Over the next two days, 42 IAS officers were transferred. After two weeks, chief secretary Singh was removed unceremoniously by an order issued near midnight. The bureaucrats who enjoyed a free rein in the BJP government, to the extent that they could even openly comment against Rashtriya Swayamsevak Sangh ideologue Deendayal Upadhyay, are now on the backfoot. 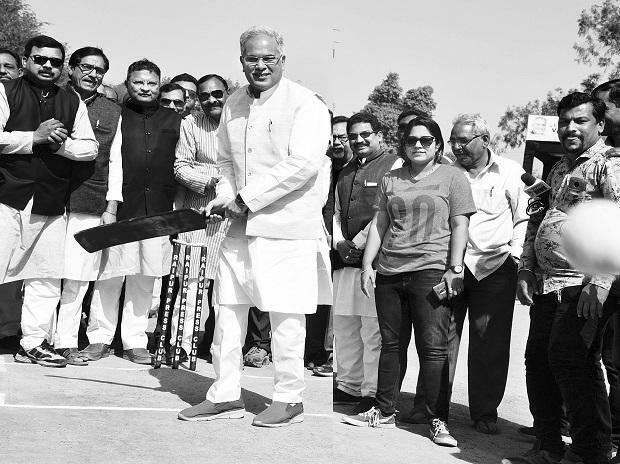 Baghel, who completed one month in office as chief minister on January 17, is a man on a mission, and has adopted a rather stern style of working to fulfill the poll promises. Instead of relying on bureaucrats or party veterans, he has handpicked four advisors who form his innermost circle. Apart from the headline-grabbing promises — farm loan waiver and increasing the minimum support price (MSP) of paddy to Rs 2,500 per quintal and maize at Rs 1,700 per quintal —which have already been met, Congress election manifesto offers curtailing electricity bills by half for domestic consumption, provisioning of houses and land to urban and rural families and pension for farmers aged above 60 years. 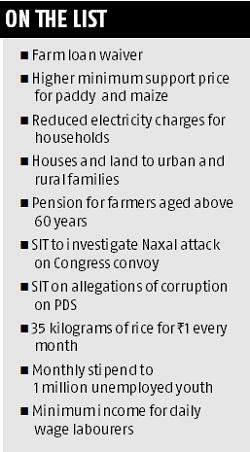 Other promises include 35 kilograms of rice for Rs 1 every month, monthly stipend to 1 million unemployed youth, a minimum respectable income for daily wage labourers, increase in income bands of Class 3 and 4 employees, distribution of Seventh Pay Commission surplus in three phases, increase in pension for families of police persons who died in Naxal attacks and the like. Baghel is moving meticulously as he is aware of the fiscal challenges. Yet his government has so far fulfilled about 10 per cent of the poll promises. “The election manifesto is for four-five years and the government is committed to realising every point,” Baghel said recently. Interestingly, he has prioritised the agenda and taken up those issues first that would hurt the Opposition and establish his government’s credibility among people. As the government issued orders for loan write-offs and MSP increase, it stirred the BJP circle by instituting two special teams to investigate the Jhiram Ghati Naxal attack that killed 27 people in 2013 when a convoy of the Congress party was ambushed, and the allegations of irregularity in the public distribution system in 2015. The Congress had been alleging serious conspiracy in the Naxal attack that wiped out the party’s frontline state leadership. The government has ordered investigations in about a dozen cases of alleged corruption. Incidentally, the man who will head the probe has been in the eye of opposition storm at one time or another. Baghel’s pick Inspector General of Police SRP Kalluri has been facing the wrath of civil rights activists for his anti-Naxal operations in Bastar, but the chief minister has put his weight behind him. Interestingly, though, Kalluri had faced sharp criticism from Baghel as well when he was in the Opposition. The civil rights activists are fuming, staging dharnas for his removal, while the chief minister’s advisors are busy fire-fighting.They say the appointment is part of a larger strategy that they cannot reveal, and that the chief minister is confident Kalluri is the right man for the job. The Opposition has termed all this vendetta politics. “Mukhyamantri badlapur ki rajniti kar rahe hain (chief minister is doing politics of revenge),” former chief minister Singh alleged. “We are ready to face probe from any agency. The Congress government has failed in just a month as it could not fulfill poll promises and has been taking U-turn on many issues,” Singh said. Baghel, who single-handedly took on the BJP government as Congress chief and led the party to victory, is not the one to relent. “We are not engaged in revenge politics; we are doing politics for change," he said. The state has entered into a confrontation mode with the Central government as well on several issues. Earlier last month, the state withdrew the consent accorded to the Central Bureau of Investigation to probe fresh cases in the state. the Centre’s court after failing to get a response to a letter that the chief minister wrote soon after taking charge to increase the MSP and enhance the state’s rice procurement quota to the central pool. Paddy procurement in Chhattisgarh has surpassed the target set for the kharif marketing season 2018-19 as the paddy flow in government societies has increased with the Congress government coming to power last month and increasing the MSP. Facing a problem of plenty, the state has revised the procurement target from 7.5 million tonne (MT) to 8.8 MT, way above the state’s requirement. Chhattisgarh requires about 700000 tonnes of rice for use under the public distribution system. Of the excess rice, the Centre has agreed to procure 2.4 MT but the state is still in a fix as it does not have enough storage to keep the extra rice. It wants the Centre to increase its quota to 3.2 MT. Besides disposing with surplus produce, it would also fetch money to the state. With the Centre dragging its feet on the issue, Baghel has decided to re-send the letter. It appears the tug-of-war will continue.